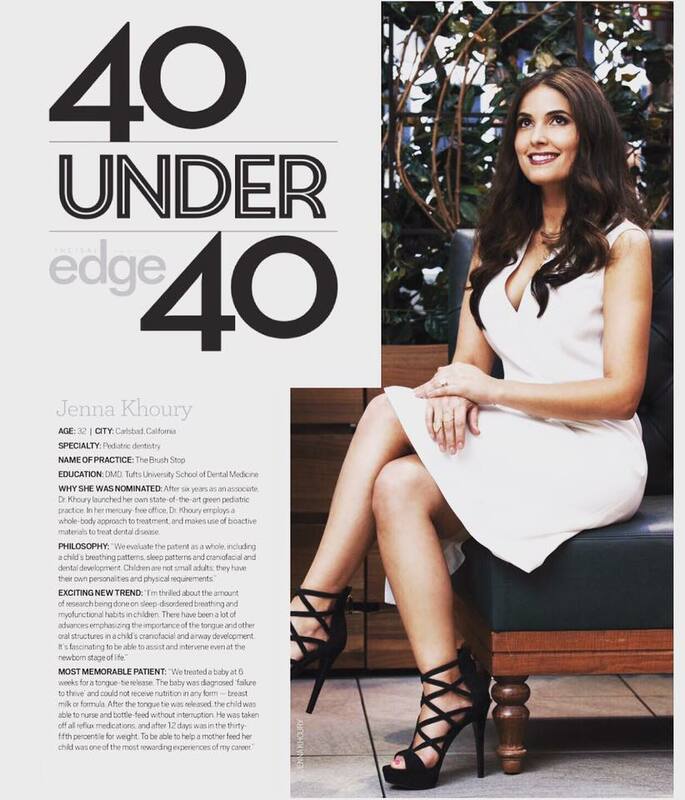 Dr. Jenna Khoury DMD of The Brush Stop named to prestigious national 40 Under 40 ‘Best Young Doctors’ in America by Incisal Edge Magazine. SAN DIEGO, CA, Sep. 30, 2016 (ereleases) — Dr. Jenna Khoury DMD, a Carlsbad based pediatric dentist, has recently been selected as a ‘Best Next Generation’ dentist by industry experts and esteemed doctors. The honor, announced in Incisal Edge’s 2016 40 Under 40 issue, is a reflection of Dr. Khoury’s ability to combine the latest, cutting-edge technology with compassionate care for her patients. The ’40 Under 40’ recognition is based on the “best next generation of dentists — doctors nominated by industry experts from around the country, vetted by an independent panel and presented in a manner befitting the honor; as the rock stars of our field,” according to Incisal Edge. Dr. Khoury, exemplifies the award criteria via her level of expertise, as well as specializations that allow her to diagnose and effectively treat complex pediatric dental issues including myofunctional habits and tethered oral tissues affecting newborns and breastfeeding mothers. The compassionate, and positive environment of The Brush Stop, and Dr. Khoury’s patient interaction, are also representative of what it means to be a leading next-generation dentist. “We have not only embraced dental technology, but also mainstream technology by bringing iPads and other tech into our office. Our patients are tech savvy from a very early age and we’ve found that having these technologies, which many of our patients use at home, is a comforting and often enjoyable aspect to their visit,” added Dr. Khoury. Dr. Jenna Khoury D.M.D. is a San Diego native who received her Doctorate of Medicine in Dentistry, as well as Specialty Certification in Pediatric Dentistry from Tufts University School of Dental Medicine. Dr. Khoury specializes in treating newborns, infants, and toddlers with tongue ties, lip ties and other breastfeeding difficulties, as well as young children and teens, for all their oral health needs. Founded in 2015, The Brush Stop is a leading, Carlsbad based pediatric dentistry and orthodontics practice that uses safe, non-allergenic and mercury free material on infants, young children. Pediatric Dentist - Dr. Jenna Khoury in Carlsbad, California serving infants, children, teens and special needs patients including the surrounding cities of Encinitas, CA, Del Mar, CA, Solana Beach, CA, San Marcos, CA and San Diego, CA.